It's been a while since I posted. That's partly because I have been working on many different projects all this past week and now starting to complete the beginning of the batch. First, I found out last weekend that I along with Nick and Sam, were runners up with the Flatstock Poster Contest. Kudos to you guys and all the great posters that were submitted. I also just got a call from an old friend who interned at Adventure the same time and is currently still there but in my old place as Art Intern. 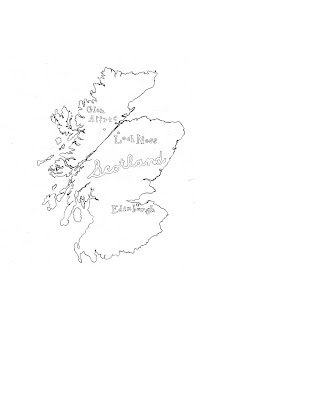 They are asking me to do a watercolor map of Scotland. WooHoo! It was like a godsend! It will be nice to make some money for France. I am just sending sketches off tonight, so hopefully go to a final this weekend. I also finished an urban legend project that is for concepts. The parameters of the project evolved over the week, first taking place in Paris, then in New York. I just kept mine set in Paris. This is the little story I wrote up to accompany my illustration. >>>>Back in the late 18th century during Marie Antoinette’s reign, there was a gardener who tended to Antoinette’s play village. She loved gardening but hated Marie Antoinette. While she would garden, she would ramble to the fish in the pond. She entrusted to the fish about how she despised Marie Antoinette, gabbing and gabbing to the fish knowing that they would never repeat her words again. 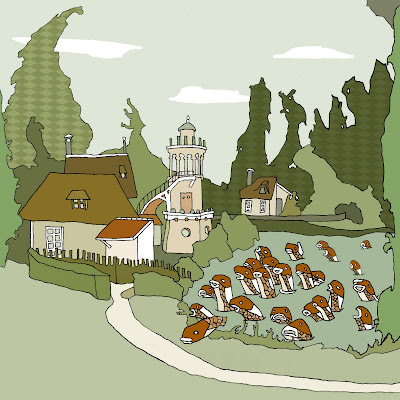 The fish loved hearing the woman talk so much that they had to fight each other to poke their heads above the surface of the pond. The woman thought that the fish only wanted bread, so wrote them off as being greedy. After Marie Antoinette’s death, the gardener never returned to the garden. She much preferred seeing her own garden blossom. Her decision was quite spontaneous, so she never had spoken of it to the fish. Meanwhile, the fish did not know where the woman went, so even until today, every time a person comes toward the pond, the fish fight to the surface to see if it is the woman gardener who has returned. Many people think they are seeking bits of bread, but are actually looking for the return of the gardener.